In this chapter you will learn to play power chords. You'll get a lot of opportunities to put them to use, playing them in songs! You will use power chords to learn about accidentals, called sharps and flats, to flesh out your knowledge of the musical alphabet. 4: EVERY Power Chord Has a Name! In this chapter you will learn how to play the major scale in several keys and why it's such an important concept. You'll also get a lot of opportunities to put the scales to use playing them in songs! 2: One Little Pattern, ALL Major Scales. Easy! 3: 'Open' Major Scales, and Cool Ways to Use Them! In this chapter you will learn a concept called the Magic L which is a means of understanding chord progressions and how they relate to key signatures. You'll also get lots of opportunities to see how the Magic L makes it easier to understand music and play songs! In this chapter you will learn all about chords, what they are and how they work and interact with each other. 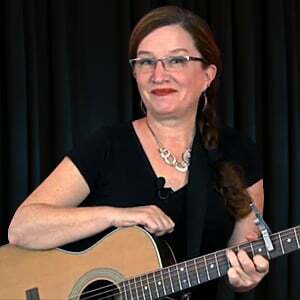 You'll also learn how to embellish chords to get new exciting sounds and use them in songs. 3: Chord Alchemy in Action! In this chapter you will learn barre chords and why they are such an important step forward. You'll get lots of opportunities to practice and use barre chords in songs. There will also be more chord change strategies to shore up any problem areas in your technique. 6: Rock Your Barre Chords with the 'Magic L'! In this chapter you will learn how to play the minor scale in several keys and why it's such an important concept. You'll also get a lot of opportunities to put the scales to use playing them in songs! 3: One Little Pattern, ALL Natural Minor Scales. It's Easy! In this chapter you will learn the basic of reading music and why it's such an important skill. You will get a lot of opportunities to put that skill to use by playing songs! 3: Musical Notation in Action! Let's Play a Melody! 4: Grand Finale! Read Melodies, Add Harmonies!